John Amico has been an award winning celebrity stylist and Salon Icon who is constantly on the cutting edge of fashion. His friends, family and business associates all share in his passion, as well as their own, for the Cosmetology Industry. As a John Amico student, our Oak Forest Campus is the ONLY basic cosmetology school, so we are focused on YOU. Our personalized training will teach you what's on the runways today in cutting, designing, coloring, hair additions and texture services. We start you out on a fast track. From Day 1, you will begin to perform hands on workshops, working on your new best friends- your mannequins. As John says, "We only have 1500 hours and it is so important that as soon as possible we train your eyes, hands, head and heart into creating image-making statements for your personal clients. You will begin your beauty school education in Level One, learning the foundation skills that will prepare you for real life experiences. In Level Two, you will begin to perform advanced methods along with formulating, creating and applying color. You will begin to apply the fundamental skills you have learned and add your own passion to complete the line and design for your client. Throughout your cosmetology education, you will also learn the latest American and European techniques. John has a manufacturing plant in Italy where he creates many of his products and Organic Italian Hair Color. You will learn that "You Are The Greatest" in the John Amico self-esteem training as well as the art of client communications. Spa Services such as: Cold Waxing, Manicuring, Pedicuring, Facials, and Makeup! As a Level Three and Four students, you will continue to perfect your skills while preparing for your salon ready school graduation. Our classes will also feature business training, conducted by John Amico, Jr., who has his graduate degree from DePaul University. These cosmetology training classes are geared to prepare you for the beauty business or possibly owning a salon or spa. Thus, being able to focus all your energies into your profession is one of the most rewarding aspects of being a cosmetologist while "Enriching the Lives of Others." The John Amico Brand of Products, Education and Services are featured in thousands of salons in the US. 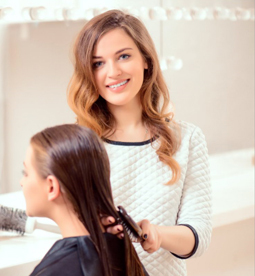 These Cosmetology Salons have learned many of the business systems that you will learn to succeed in this great Beauty Industry. Remember, Follow Your Passion, Love What You Do and You Will Become a Success no matter what the adversity, objections or difficulties that your will face in life. Life is a "do-it-yourself' project. Your Positive Mental Attitude is "You Can and You Will Succeed in Life and in Business."